I just found a video on YouTube that someone posted from their iPhone....they took some video during this past December's Madrigal Dinner. And they have a tiny snippet of me juggling knives embedded in it, at the 1:27 mark. 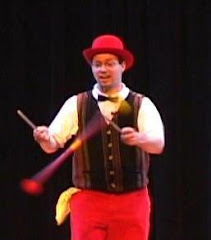 Here's a link directly to the spot where I juggle. And if anyone wonders why I keep going back to this show, here's a snippet of the same video where the choir sings the Carol of the Bells.